The Keen Movement wanted to partake in a child- driven project and therefore decided to run a Toy Drive. This drive lasted for the duration of two months, from the beginning of April until the end of May, with the objective of using a toy to bring joy to a kid’s life. Setting a steep goal of collecting 100 toys to impact the lives of 100 children, Keen eagerly appealed to the rest of their community to get involved. St. James Church, in Kenilworth, willingly partnered with Keen by adopting the drive as a project for their youth. Their junior and senior youth groups took the Toy Drive on as a challenge and tried to collect as many toys as they could. The contents of the Toy Donation Box increased considerably each week and once the drive was done, the next challenge that Keen faced was to identify organisations to which the toys could be donated. 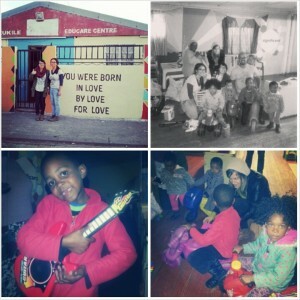 Nozukile is a creche located in Section B of the Khayelitsha community which Stassie identified as a place in need. Stassie is from an organisation called the Today Initiative who recommended Nozukile crèche to the Keen Movement as an organisation filled with children that were eager to receive some toys. Six bags, some loose toys and four toy bikes were delivered to Nozukile by three Keen members Julia, Matthew and Lisa along with Stassie from the Today Initiative. Unfortunately most of the children had left for home as it was already late afternoon when the toys were delivered. However, Keen was welcomed by four of the cutest children, their principal and a few other staff members. The kids and the staff members were very excited when they saw the Keen members arrive with bags of toys. They were eager to play with and explore their new toys, especially the toy bikes, while the principal of Nozukile was highly grateful for the toys that were given to their children. As a result Nozukile was filled with smiling faces and loads of excitement. The rest of the toys collected from the Toy Drive were donated to St. Joseph’s Home for chronically ill children. This home was identified by Regan, an active Keen member, who came across it during her physiotherapy practical. Keen members who delivered these toys were Matthew, Julia and Robyn-Leigh. 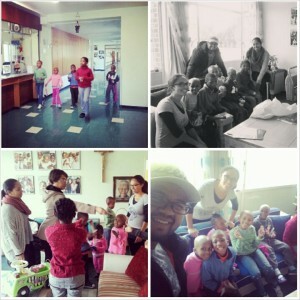 St Josephs’ Home appreciated the toys that given and the home was filled with happiness. Keen would like to extend a special thank you to all who contributed to this Toy Drive and assisted in allowing various Keen members to assume the role of Santa over the past week. Keen members, friends, families, the St. James youth groups as well as Stassie from the Today Initiative played a pivotal role in the drive’s success and you all have touched many children’s lives with your generous contributions. This was definitely an example of how partnering with one another can impact our community for good. This entry was posted in 2014 and tagged children, Keen, Nozukile Creche, St Josephs Home, TODAY, Toy Drive, toys, volunteers. Bookmark the permalink.